FC Goa opened their account in the third edition of the Indian Super League at Rabindra Sarobar Stadium on Sunday when they held Atletico de Kolkata to a 1-1 draw. Jose Molina’s side played out their third draw of the season in a match which would be remembered for Fernando Guerrero’s controversial officiating decisions. Jose Molina handed Abinash Ruidas and Stephen Pearson their first starts of the season as Javier Lara started centrally, in a position where he has been the most influential for the Kolkata-based club. Zico made five changes to the side which lost 2-0 at Chennai just days ago, with Robin Singh starting up front. The Gaurs' backline sported a new look as well with Gregory Arnolin resuming duty alongside Rafael Dumas, while Raju Gaikwad and Keenan Almeida started at full-back. Atletico drew blood within minutes after kick off as an exquisite volley from Sameehg Doutie beat Subhasish Roy Chowdhury. Javier Lara’s set piece had found Iain Hume at the far post, whose header was poorly cleared by the Goan defence and the ball found Doutie right at the edge of the penalty area. Zico cut a frustrating figure on the touchline as his side was forced to chase the game for the fourth time on as many occasions. Prior to their match against Atletico, Zico’s men had scored only once from nineteen shots on target while they conceded a combined total of six goals from twelve shots on target by their opponents – a statistic which baffled fans and pundits alike. The theme seemed to continue in the first half as the likes of Robin Singh and Joffre Gonzalez failed to create quality chances in the final third. FC Goa enjoyed a healthy share of ball possession but seldom troubled Debjit Majumder’s goal. On the rare occasions that one of the Gaur’s attacking-minded players made it past the Atletico backline through fluid movement, he lacked support from his team-mates. Ever since their scoring draw against Chennaiyin FC, Atletico have made it a point to defend deep and stifle space for the opposition. On two separate occasions, Trindade Goncalves and Joffre were clear through goal due to their swift movement between the channels, but the final ball was lacking. FC Goa’s best chance came through a Robin Singh strike seven minutes from half time when the Indian international turned and converted a half-chance into a shot on target, but was denied by a fine save from Majumder. Abinash Ruidas’ stars catapulted further with yet another excellent performance on the left flank – showcasing his dribbling skills as well as peppering in crosses to break through Goa’s defence. The visitors seemed disjointed in the attack and individual mistakes creeped in at the back with Atletico outplaying them in every aspect. The fact that Atletico have failed to put away their chances have repeatedly cost them points throughout the short season – a concerning trait Jose Molina must immediately work upon. The Red and White Army have been prone to lapses in concentration and have lacked the killer instinct to annihilate the opponent out of the game – a quality which usually separates the champions from the hopefuls. Stephen Pearson’s straight red, as much unfathomable for it was an offense worth only a caution, did not tilt the game in FC Goa’s favour. Instead, Atletico attacked with more fervour and Javier Lara almost scored a stunner when his dipping, swerving free-kick was just saved by Roy Chowdhury. 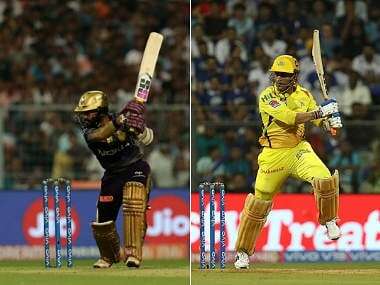 The game had not yet seen its complete share of drama as Sanjay Balmuchu was dismissed as well for his challenge on Prabir Das. The two red cards capped off an interesting night for the referee Fernando Guerrero who cautioned as many as ten players from both sides. This, however, was not the most controversial officiating decision of the night – Borja was unluckily adjudged to have handled the ball within his own penalty area. 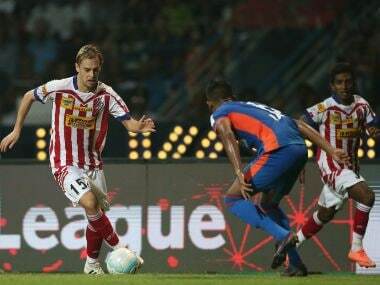 Joffre scored the resulting penalty to bring FC Goa back into the game. “I didn’t see from the dug-out, I didn’t see on TV. Borja told me that it was something unlucky, you know. He didn’t want to touch the ball. I think it’s not a penalty,” Molina lamented after the match. Zico, on the contrary, was “pleased” with his team’s performance, but a tactical change might be in order for last season’s runners-up. 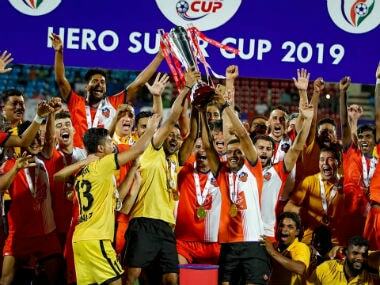 Robin Singh’s return from injury ensured the Gaurs played with a little more purpose in front of the goal, but Rafael Coelho has continued to disappoint in spite of his tenacity and workrate. 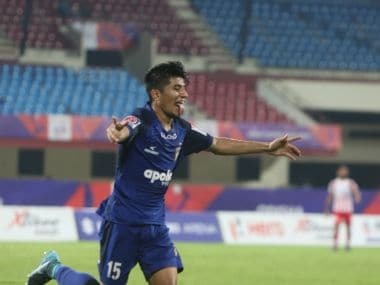 The lack of an elite deep midfielder has shone through as Goa has struggled to control the mandate of the game – Balmuchu’s suspension might force Zico to field Pratesh Shirodkar in front of the defence, in a role the 27-year-old is absolutely natural at. With the likes of Romeo Fernandes and Mandar Rao Dessai (two players who proved to be game-changers during the second season) in their ranks, Zico must find a way to incorporate their strengths to his side. Injuries and suspensions to a number of first-teamers might force Atletico into a personnel crisis as well, but Molina remains confident of Atletico’s ‘last four’ chances. The Portuguese stopper Henrique Sereno adapted effortlessly, but it is the absence of the other Portuguese Helder Postiga which is proving detrimental. In an Indian Super League season which has largely been devoid of magical footballing moments so far, only two points separate the middle four clubs of the pack and Atletico must start winning soon or else a few ‘unlucky’ moments could completely unravel the still-unbeaten campaign.